Twenty-two year old developer John Bowers of EspressoSoft has given us the heads up on an iPhone game he will soon be releasing through the iTunes App Store called StarSmasher. And we’re pretty excited. 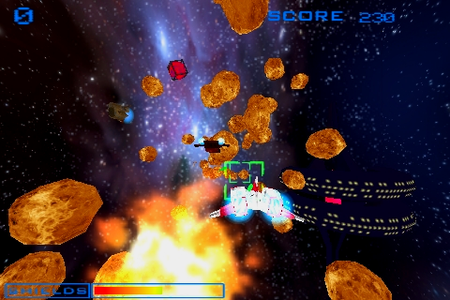 Become the captain of the stars in this 3D arcade style space shooter. Dodge asteroids, watch out for proximity mines, and battle a never ending stream of enemy ships bent on your destruction. espressoSoft is proud to present StarSmasher as a soon to be addition to your iPhone/iPod Touch app collection. StarSmasher‘s gameplay is modeled after Star Fox, an extremely popular franchise that debuted on the Super Nintendo back in 1993 (the SNES version featured an on-cartridge graphics accelerator, the Super FX chip, making it the first hardware-accelerated 3D console game). The player’s ship is accelerometer controlled–tilt to steer–and lasers are fired by tapping anywhere on the screen. While we haven’t seen a preview video or a full StarSmasher gameplay screenshot gallery, what we have seen is impressive. We have high hopes that this will be as much of an engaging, white-knuckle shooter as it sounds. StarSmasher is expected to appear in the iTunes App Store sometime in the next few weeks. Stay tuned for a full review and video demonstration upon its release. UPDATE: The asking price for StarSmasher in the iTunes App Store will be $2.99.